Look at a Lego brick and what do you see? A studded, brightly coloured block. Perhaps you remember them from your childhood. Perhaps that brick was part of a fire engine, a race car or a bulldozer. Some people look at Lego bricks and see great potential buried within them. In their hands Lego rises above its childhood origins and gets a chance to aspire, to be part of something great. 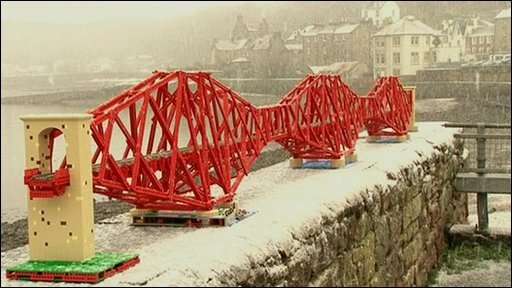 In Warren Elsmore's hands 11,000 Lego bricks have been fashioned into a scale model of the Forth Railway Bridge. The real thing is a marvel in all its riveted splendour and its tiny cousin, which stretches 6.5 metres, is too. Its spans have the same breath-taking arcs as the original and the similarities do not end with its looks. Whatever you build in Lego, you need a lot of bricks. "The parts they had problems building on the real bridge were a problem for me too," said Mr Elsmore. In particular, he said, the point where the pylons and bridge supports meet on the base were very tricky to render in Lego. Just as in the real bridge, some parts of the Lego model are in compression and some in tension. The structure even flexes when under load. The bridge is regularly shown off at Lego shows and some bits of it have to be replaced when Lego trains have been running across it for a few days. 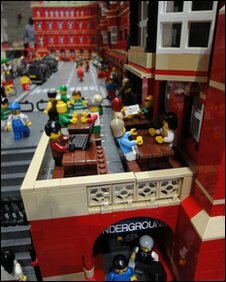 "They turned to dust," said Mr Elsmore who is also chairman of the Brickish Association, the UK's club for adult fans of Lego. The model took 18 months to put together and, so far, is the biggest model Mr Elsmore has built. Unlike the designers of the original, Mr Elsmore could turn to computers to help him draw up his plans. 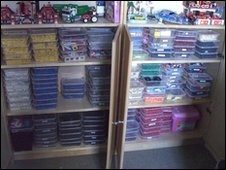 He used a program called LDraw which is effectively a computer-aided design package for Lego bricks. Warren Elsmore's model is more than just bricks. LDraw is written and maintained by adult fans of Lego. It is kept updated so the new pieces that Lego releases are turned into virtual versions so people can use them in their models. "Lego is no longer about a 2x4 brick with studs on the top," said Chris Dee, one of the many Lego fans who helps to maintain LDraw. "There are a lot of specialised elements created for individual sets." "You need to understand what physical parts exist in order to use it," he said. "LDraw is a system of tools for virtual modelling," he said. "It includes a library of parts and a set of tools and utilities to make use of that library." "Lego has produced a CAD tool that's freely available but the level of sophistication does not match LDraw and the parts library is smaller," Mr Dee told BBC News. "They have the advantage of having the design drawings for the bricks. We are effectively reverse engineering the parts, sometimes that is easier than at others." Adult fans of Lego use LDraw in different ways, said Mr Dee. Some use it as a design tool so they can work out how to build a particular model. One utility divides a building task into a series of steps just like in Lego instruction books. "Some prefer to doodle with the physical bricks then they will use LDraw to keep what they have done and then rip it apart and try to improve it," he said. "There are also people that use it as a documentation tool after they have created a model," he said. But, said Mr Dee, using LDraw does not remove all the skill involved in making a Lego model. "LDraw can show you how to represent a physical entity in the parts but it cannot tell you whether it will hold together," he said. "Sometimes there is just not enough connectivity." Mr Elsmore is using LDraw to plan his next model or MOC (My Own Creation). This is far more ambitious than the Forth Bridge. He is taking on the task of rendering in Lego, London's St Pancras station. So far, he has built the hotel at the front. Next comes the engine shed round the back. The finished model will be made of more than 100,000 bricks. Building that would be impossible without a tool such as LDraw. 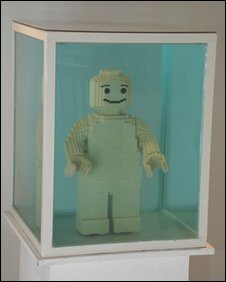 There are some Lego fans that use the bricks in much more artistic ways. Justin Ramsden, at 18 the youngest member of the UK's Brickish Association, is an art and design student who is using Lego as his medium. "I've been using Lego all my life," he said. Many older Lego fans talk, he said, of a "dark age" when they put the bricks aside before returning to them later on. "I have never really had a dark age," he said. "From the start, I just got my older brother's sets and broke them up, rebuilt them to my own design." So far, Mr Ramsden has not turned to tools such as LDraw. "I tend to build from eye or draw a few sketches and if I run out of bricks then I buy some or find them," he said. He has built a model of himself, undertaken commissions from the local council and is working on a life size head of Amy Winehouse made from Lego. The attraction for all the adult fans of Lego is its versatility. Many might dismiss it as a toy, a child's plaything. When they are told about what some are planning to build they might dismiss it and declare it impossible. The Lego fans know better, just like the men who built the Forth Bridge.